It is the leading magazine of our publishing house. Is universally recognized and more authoritative specialized issue which have been read by general directors and main specialists of food production industries more then 75 years. 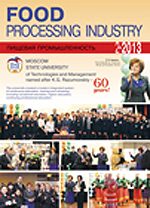 Materials on techno­logies, equipment, raw materials and additives, calendars and reviews of exhibitions, articles about companies, interviews with specialists and top mana­gers of enterprises are published. Quality and safety, news from companies and professional branch institutions, R&D institutes and higher educational institutions, events and facts are covered. Issued monthly.